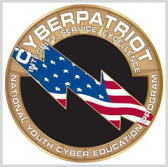 Northrop Grumman awarded $52,500 worth of scholarships to the high school teams that won at the CyberPatriot X National Finals Competition, which took place on April 17. An awards banquet was held on April 18 at the Hyatt Regency in Baltimore, where the winners were announced, Northrop Grumman said Wednesday. The cyber competition is the centerpiece of CyberPatriot, an education program developed by the Air Force Association. Northrop Grumman is CyberPatriot’s presenting sponsor.